Some chiseling required on templates with square corners. Increase security and privacy in your home by replacing interior and exterior doors without damaging the jamb or door frame with the Door Mortise Kit™ from Milescraft®. By routing matching mortises for hinges, strike plates, and latch plates into the door and jamb, you won't have to tear a hole in the wall just to hang a better wooden door. 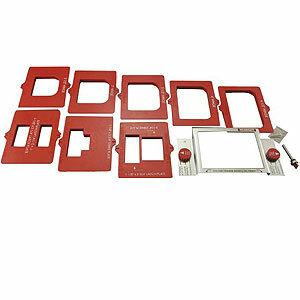 Featuring an easy to use drop-in template design with a sturdy steel frame, this kit comes with everything you need for most hinges, strike plates, and latch plates on 1-3/4-Inch and 1-3/8-Inch doors and jambs. Simply set the door thickness selector knob, attach to the door or jamb, drop in the plainly marked template for your door hardware, and rout! Includes a durable tungsten carbide tipped 1/2-Inch router bit with ball bearing (2216), eliminating the need for guide bushings. Also includes an Easy Measure Guide where we have done the math and made it simple for you to get standard industry placement of your door hardware. Centered tabs on each template ensure complete accuracy. This product is packaged in a clamshell that snaps shut to act as a hanging storage container for your templates when not in use. Simply cut off the package seal edge when opening for reuse. For best results, we recommend applying 2-4 pieces of tape to the templates. 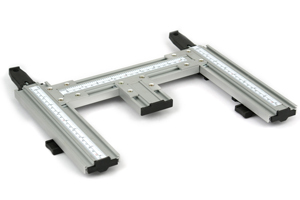 A simple to use hinge mortising system, the Hinge-Mate is completely adjustable and will work on virtually any door, door jamb or stock up to 5" wide. Simply clamp the jig to the stock, adjust the slider to the width of the hinge and make the cut. The system can cut hinge mortises up to 2-1/4" wide by 5-1/4" long. 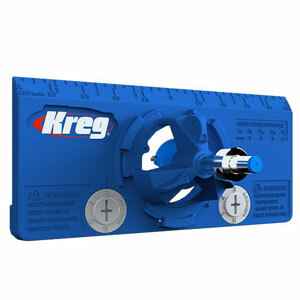 The package comes with all the necessary parts including a mortising router bit to make the cut. The Concealed Hinge Jig allows you to drill cup holes for concealed cabinet door hinges (sometimes called “Euro hinges”) using just a drill. The jig positions an included carbide-tipped bit exactly at the proper position and offset, and drills to the perfect depth every time thanks to depth stop collar. The jig is simple to use, and it ensures that you can mount cabinet doors that fit great and work properly.